You can actually get sockets for the chip, maybe some nice person can make a 2 way dongle with a socket instead? Best of both worlds as it would reduce the problems with overheating if it also integrated active cooling into the socket lid. Wonder if there is a market for a card designed specifically for laptops, to replace the existing wifi card? It would be relatively simple to add a second antenna so it can still be used at low speed, and other antenna just for SDR. Someone needs to combine the Fresco Logic FL2000 and the R820T2. Some of us are ready for two-way experiments. Hi, just a thought but it might be worth people looking for broken RTL units because typically the problem is a bad USB port or other anomaly. My unit has an overheating issue possibly related to a dodgy batch of regulators? The memory chips sometimes go wonky as well resulting in all manner of anomalies but I can fix this. I have a project that needs a number of these so please let me know if you have a b0rked unit and want rid of it. Incidentally some portable DVD/TV combis use a separate board which contains an SDR but can sometimes be repurposed. as it essentially has a similar chipset with a custom memory. Nooelec claims their dongle is made in the USA not China. Is it true? Where are they getting their R820T2 from? That can’t be legal to advertise made in the US then. I would guess that if the largest percentage of the value of the items on the final BOM (Bill of Materials) originated from within the US, and the actually testing, assembly and soldering of the components to the PCB (Printed Circuit Board) was carried out in the US, then it would probably be legal to claim. From information on comments to this post the cost of a R820T2 when bought in bulk was under a dollar, which would probably be less than the cost of the PCB to manufacture. What are the design tradeoffs of including the low frequency SWL/HAM bands in these? Say down to 3 MHz. I imagine there is some technical or coast reason. More precisions about the situation. We sampled new reels of the R820T2 before launching bigger batches as usual and discovered that the quality is not the same as before. Rafael Micro confirmed that they moved the extended production to another fab for the discontinued parts. I suspect the change in quality results from the quality of the silicon. This might be OK for the ultra cheap dongles, but it does not pass the rigorous testing we have in the Airspy production. The question is more about the quality of the last few runs of R820T2 than our ability to purchase high volumes. These thingies cost less than $1/piece in volumes. 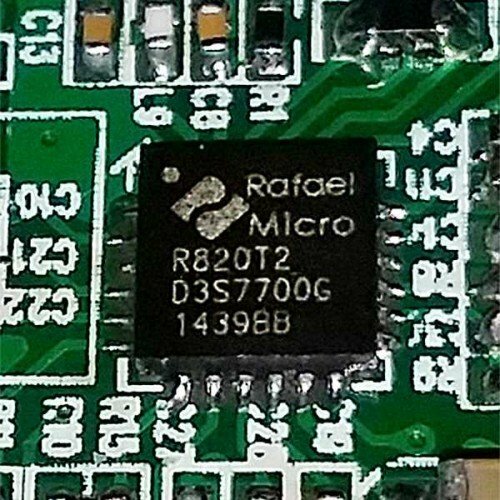 Why Raphael Micro would not merge two orders into one production batch when producing chips for the big Chinese manufacturer? Thanks admin for the clarification. I also wondered about your situation because you make a leaving of it, and I would be very sorry for you to loose your income. I’ve now switched to a SDRPlay2. You also mention “alternative tuners”: even if it is possible, that would mean a re-write of the drivers at a minimum so it fine to stick with R820Tx as long as we could I guess. For alternatives there’s the Rafael R828D which is basically identical to the R820T2 except it has an extra front end switch, but costs about double last time I checked. The R828D is already supported in librtlsdr. But the PCB would still need to be redesigned because the pinout is a bit different. Anyone has the R828 datasheet and map registers pdf file available? It would be interesting to know if anyone is already working on LIBRTLSDR, adding new TUNER IC model. I find it very difficult to get technical information from RAFAEL MICRO, almost impossible. All big IC manufacturers have technical documents available on their websites. RAFAEL MICRO don’t even answer any emails from customers. Horrible. Customers? you are not their customer, you are an end user. No. I’m a customer. But I buy R820T2 IC from China authorized distributors. So, the problem remains and is real. RAFAEL MICRO doesn’t answer customer’s requests properly.